Some of you will have noticed that the Albert Bridge has recently undergone a startling renewal and this provides us with a great example of what can be done when Stamfordians pull together. Paddy Jelen, one of our committee members, noticed that the Grade II listed bridge was “very dirty and mossy” and that the light was in disrepair and she set about getting something done to restore it to its former glory. ​She enlisted the help of John Regis from Stamford Pressure Washes who very kindly gave the bridge a free clean and also solicited the advice of Richard Walters regarding the Bridge and Gary Feredey regarding new lighting. Don Lambert, from the Urban Group, was also on hand to give advice. Funding was provided by the Skells Trust, SKDC, who fitted the new lamp with- out charge, and Stam​ford Civic Society. What better way to finish things off than a splash of gold paint? 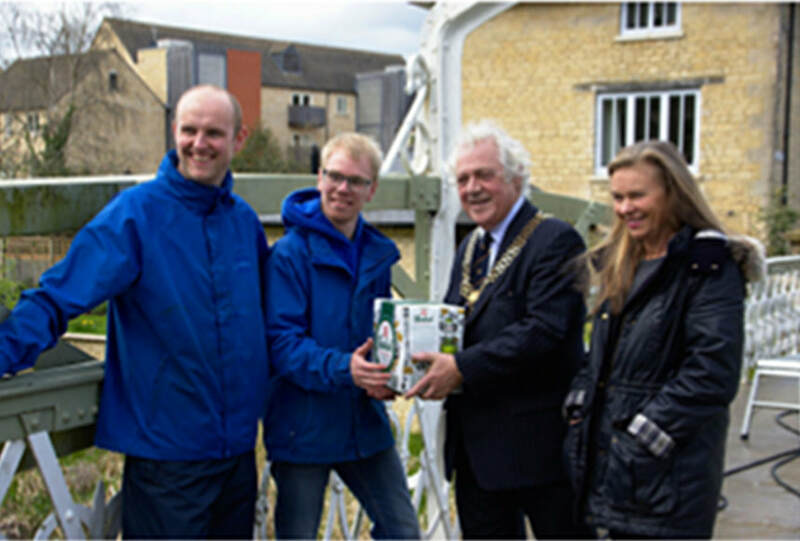 The Mayor John Dawson said, “A team of volunteers, working for nothing, have achieved this and if we all pull together it shows what can be done for Stamford”. Paddy feels “this beautiful bridge could now well serve as a wedding photo venue with the town bridge and willow trees in the background”. A great improvement indeed.